Recommended by Ministry of New and Renewable Energy, Govt of India, Supported by Ministry of Forest and Climate Change, Govt. of India), is the most popular and favorite E-mobility Motorsports, Education and Research Publication organisation in India among engineering institutes and green energy research organisation. ISIE become the epicenter of green energy concept development in India. We are motivating people (Engineers + Future Engineers) to work on New and Renewable Sources of Energy. We give the platform to new start-ups, Innovative ideas and to passionate people, who really want to contribute to society. Formula Imperial is student formula style vehicle design and manufacturing event. The event formerly known as Hybrid Vehicle Challenge-HVC. The objective of the challenge is to design and fabricate a hybrid vehicle or an electric vehicle or Combustion Vehicle under event design restrictions so as to give the chance to students demonstrate and prove their creativity and their engineering skills in comparison to teams from other universities or colleges around Asia. Teams will use IC engine and electric motor to run their vehicle which is called hybrid formula vehicle or a vehicle that is charged from an electric source and propelled by electric drive only which is called electric formula vehicle. 6th Formula Imperial-HVC also introduced Combustion Category in which formula Vehicle is propelled by IC Engine only. Imperial Society of Innovative Engineers (ISIEINDIA) is the most popular and favorite Motorsports, Education and Research Publication organisation in India among engineering institutes and green energy research organisation. ISIEINDIA organize FORMULA IMPERIAL-HVC ( formerly known as Hybrid Vehicle Challenge-HVC) event from last 5 years, more than 285+ of teams have participated in this event with 30K+ of student participation who have learnt a hand on experience by working with a hybrid technology. We have organised successful 5 seasons of this event, FORMULA IMPERIAL-HVC covered by Many National News channel and Multiple Newspaper in all over India.The Electric Formula Category has been introduced in our 4th Season of Event & The Combustion category is introduced in 6th Season of Event. Now, For Teams in 6th FORMULA IMPERIAL-HVC can participate in three categories: Electric/ Combustion and Hybrid Category. Imperial Society of Innovative Engineers has dedicated itself in the field of technology. Every year we organize three events – Electric solar vehicle championship, Formula Imperial (formerly known as HVC) and Indian Karting Race. We have also trained more than 54000 youth on various technology and production based program. 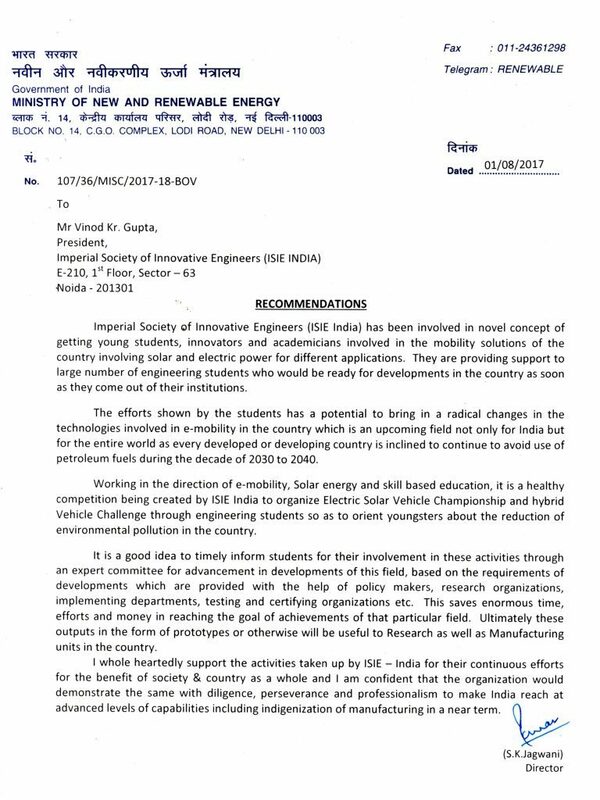 In the recognition of our services in the field of technology, Mr. Vinod Gupta (founder and president) received the National Youth Award on behalf of Imperial Society of Innovative Engineers on 12th January 2018 by the Chief Minister of Uttar Pradesh, Mr. Yogi Adityanath during the National Youth Fest organized in Gautam Buddh University, Greater Noida, Uttar Pradesh. ACCREDITED BY SFI FOUNDATION INC. The SFI Foundation, Inc. (SFI) is a non-profit organisation established to issue and administer standards for the quality assurance of speciality performance and racing equipment. The SFI Foundation has served the automotive aftermarket and the motorsports industry since 1978. Our service to the industry is a system of developing and administering various standards, certifications and testing criteria for use in motorsports. ISIE is the Associate member of FMSCI. We aim to promote youth for sports and especially for Motorsports in India. The FMSCI is the only national motor sport federation recognised by the Government of India for the promotion and control of motor sport in India, and is affiliated to the prestigious Indian Olympic Association. The FMSCI is affiliated to the Asian Motorcycle Union (UAM), the Continental Asian wing of the FIM. Having been the ASN of the FIA since its inception but for a few years in between, FMSCI now looks forward to stability and growth of Motorsport in the country. It has been the FMN of the FIM uninterrupted for the last three decades. Over the years, it has involved leading business corporates like JK Tyres, MRF, Indian Oil Corporation, ITC, the UB Group, McDowell, Birla Tyres, Popular Automobiles, Ceat Tyres, AVT, Goodyear, Maruti, TVS, Escorts Yamaha, Hero Honda, actively in motor sport, which has benefited the sport immensely. ISIE is the global platform, we are giving services among Asia. ISIE is giving services in 19 state of India and 3 Countries (India, Bangladesh, and Sri Lanka). We are giving our innovative services to more than 50,000 + peoples. Our services and product have been appreciated and noted by delegates from 22 countries. We are under pipe line to make some MOU with International association for the better tomorrow of our engineering students and Society. Formula Imperial gives the opportunity to do research and innovation on a hybrid vehicle and on Electric Vehicle to promote Green Mobility in all over Asia. In Formula Imperial ( Formerly known as HVC), Teams from Bangladesh and Sri-Lanka also participated in Formula Imperial with Teams from 19 States of India. Formula Imperial Teams have opportunity to participate in ISIE-STARTUP SUMMIT on national level. We are giving platform to those academician/industrialist who has an endeavor to become an Entrepreneur, has Innovative Ideas and can think out of the box. We are working as a bridge between industries and Educational institutions. 8+ Companies associated with us in 4th Season for placement of deserving participants. Would you like to participate in 6TH FI-HVC?